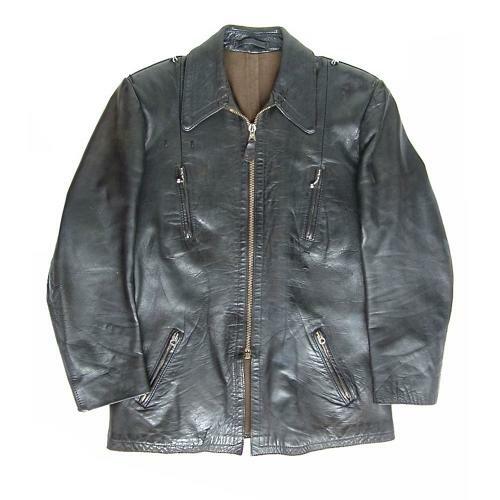 Privately purchased flying jacket manufactured in beautifully soft black hide. This is of a more unusual slightly longer hip length fitted design with front zip fastener and angled zip pockets at the chest and midriff. Mid brown moleskin type lining with satteen lined sleeves. No internal pockets. Fitted with pebbled finish 'silver' buttons for rank shoulder boards and stitched loops for a metal Luftwaffe breast eagle and award. The leather is in very good to excellent condition, supple and with only signs of normal use/wear and tear. No damage or repairs. All original 'Zipp' brand zips are in excellent condition complate with puller tags. The lining is in excellent condition too. No manufacturer's label and with just one small cloth tag inside one of the pockets (see photographs). A lovely jacket and a superb display piece. Please note that the Luftwaffe wing shown is for illustrative purposes only and is NOT included in the sale. Stock code J22485. Approximate measurements : 39" pit to pit, 15.5" pit to cuff, 26.5" collar seam to waist. All taken with jacket laid flat and zipped.